World 3-3 is the third level of World 3 in New Super Mario Bros.. 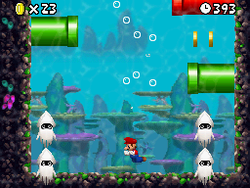 This level is an underwater level that contains many Cheep-Cheeps and Bloopers, as well as Warp Pipes blowing out air. The player starts off in a small area with the green Warp Pipe leading to the underwater section of the level. The first ? Block contains a power-up. Just before the first yellow pipe is a Hidden Block containing a 1-Up Mushroom in an alcove above the pipe. After the next pipe is a large chasm containing a Star Coin and a ? Switch. Hitting the switch will stop all the pipes in the level from blowing out air for a short time, which the player needs to do in order to access the next area. Going up and over the wall, the player will activate the checkpoint of the level. The ? Block above in the middle of all the pipes contains a power-up. Entering the chasm below, the player will find a Red Ring and going through it will make Red Coins appear in the alcove. Continuing right, the player will find several pipes, with some shooting out air that will propel the player through the small tunnel. The pipe on the ceiling will lead the player to the Goal Pole. Star Coin 1 - Before hitting the orange switch to stop the bubbles, the player can see the first Star Coin guarded by a roaming Blooper. Star Coin 2 - After passing the Red Ring, Mario should head into the third pipe from the left. He should the Bloopers and Blooper Nannies and go to the lower right corner. Mario should grab the Star Coin and head to the upper right corner to leave. Star Coin 3 - Before leaving through the Warp Pipe to the flagpole, Mario should head to the bottom of the level. He should get the Star Coin, and quickly head back to the surface, as four Bloopers will appear. This page was last edited on April 6, 2019, at 01:30.